Motorized Blinds are the window covering industry’s answer to the demand to make everything in homes smarter, easier and more convenient. They allow you to transform your space into the connected home of your dreams, while at the same time saving energy. As their name implies, motorized blinds raise and lower via a motor, which means you don’t have to fuss with lift cords, chains or even cordless solutions. 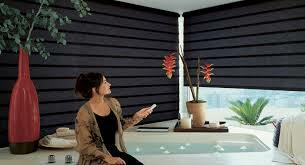 Instead, all you do is press a single button to raise or lower even or uneven rows of blinds in seconds. Homes with several large windows in multiple rooms need large window coverings. 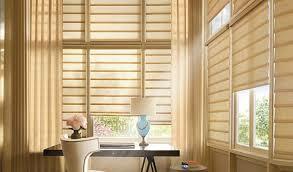 Those large blinds or shades may need to be adjusted multiple times per day to get just the right lighting. With motorized blinds, you don’t have to manually raise or lower the blinds. Just push a button and you’re done. You can program Motorized Blinds to raise and lower at certain times of day which means your programmed blinds can also give you peace of mind as you’ll know that your home appears “lived in” even when you’re away for days or weeks on trips or vacations. However, despite the many benefits, it’s important to consider how motorized blinds fit into your overall home design plan and budget. Motorized blinds or shades cost more than traditional counterparts because you’ll have to purchase a motor for each set of blinds. While in the end, you will get more out of your motorized blinds and will likely save money on your energy costs down the road, the upfront price tag should be something that fits into your budget. If you’re looking to install window blinds in your home, visit our showroom and select the best option that suits your taste and budget. Contact DC Shutters for Motorized Blinds in Brampton, Oakville, Kitchener, Waterloo, Hamilton, Niagara, Toronto, Richmond Hill, Aurora, Newmarket, Ajax, Whitby, and Oshawa.